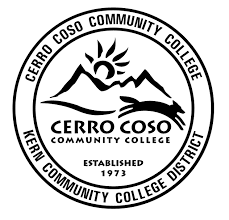 Cerro Coso Community College is a 2-year, public institution that serves eastern California in Ridgecrest, CA. Cerro Coso’s East Kern location serves the communities of Edwards Air Force Base, Mojave, Boron, California City, and Tehachapi. Cerro Coso offers academic support to military & veterans by offering college credit for military experience, DSST, and CLEP exam scores. Cerro Coso Community College is a partner of the Community College of the Air Force (CCAF) for the General Education Mobile (GEM) program. This means that airmen can complete up to 15 credits of their general education requirements to be applied directly to a student's Associate in Applied Science (AAS) degree at CCAF and/or a degree at Cerro Coso Community College. Cerro Coso also participates in the DoD’s Tuition Assistance for active duty personnel. Cerro Coso's service area includes a population base of just over 85,000 individuals. The College officially opened in the fall of 1973, and within the year began expanding its service area to include the present region. Cerro Coso, as an institution, has a long history of valuing students as individuals with unique capabilities and needs and a teaching-learning process that motivates students towards excellence.